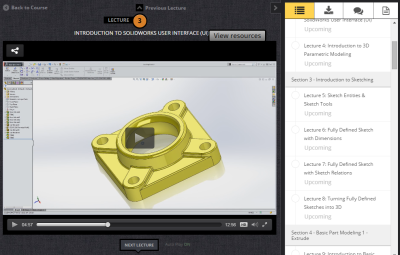 New SolidWorks Self-Paced Course Launching in January 2015! Here’s wishing you a very Happy New Year, and a wonderful 2015 ahead! I started the year by working towards fulfilling a New Year Resolution. I have been working on a self-paced e-learning course that will be launching soon in January 2015. This course is catered for the absolute beginner to 3D modeling in SolidWorks 3D software. Through this course, students can expect to learn the theory behind parametric 3D modeling, and work through the different features and commands in SolidWorks, and be proficient in modeling Parts, Assemblies and creating 2D Drawings. This is a very comprehensive course, and I envision students to be proficient enough to take the Certified SolidWorks Associate (CSWA) certification exam after completing the rigors of the course. I will also be including a comprehensive CSWA preparation lesson at the end of the course. Here is a screen capture of the progress of the course. I will be posting updates on my progress.